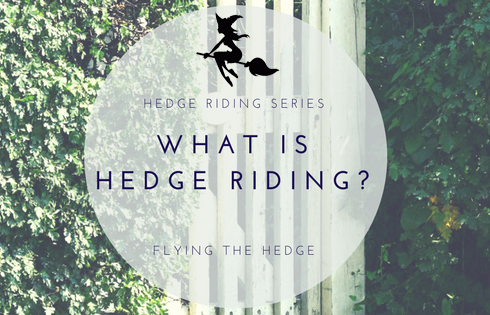 Flying the Hedge: Hedge Riding Series: What is Hedge Riding? This year I decided to cover hedge riding in an eleven part series in an attempt to clear up some misconceptions about hedgewitches while providing practical advice for novice witches or those seeking a new path. As a hedgewitch, hedge riding is a large part of my practice, as is working with my animal and spiritual guides. Not only does each ride give me valuable insight, but I often finish feeling invigorated and relaxed. Nothing quiet soothes my depression and anxiety like visiting my animal guides, Meka and Rocar. Because I have found these experiences so valuable to my practice, I felt compelled to tell my story in hopes of helping witches around the world. While many people will call themselves a hedgewitch, not all of them are 'true' hedgewitches in that they practice the main feature of hedge witchcraft, hedge riding. Most people are unfamiliar with the terminology hedge riding, but not the concept of traveling to other realms. The 'hedge' in 'hedgewitch' and 'hedge riding' has multiple meanings, the most prominent being the boundary separating the our world from the 'Otherworld.' The hedge also represents a physical and psychic protective boundary, thus separating spirit from human. Hedgewitches are said to hedge ride or 'ride the hedge (fly the hedge in my case),' meaning hedgewitches routinely cross the veil into the spirit otherworld. But what exactly is hedge riding? 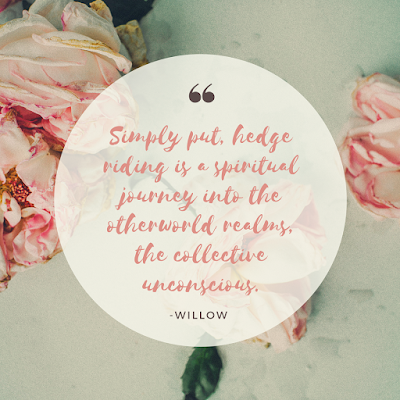 Simply put, hedge riding is a spiritual journey into the otherworld realms, the collective unconscious. It is shamanic and seidh in nature, but with some stark differences to separate the three. Seidh involves communication with the spirit by a group of people using an oracular. Generally, hedge riding is solitary in nature, making it perfect for any witch who is unable to find others or doesn't wish to work with other witches. However, there are some hedgewitches that work in groups, using the opportunity to share stories and gather more insight into the meaning of their journeys. Sometimes having a second set of 'eyes' on the subject brings light to things you may not have considered before. While hedge riding also has many features in common with shamanism, unlike shamanic journeying, hedgewitches usually do not engage in psycho-pomp work. Instead, hedge riding is used for healing, to search for knowledge, divination, or assistance in spell work. Furthermore, hedge riding is also very distinct from meditation and pathwalking. Unlike meditation or pathwalking, hedge riding is not controlled and the witch physically leaves our realm to travel to others; the traveler does not determine what will or will not happen on the journey, just as you don't control what does or does not happen on your drive to work. While you can control your personal actions, you cannot control the actions of the beings and abiotic factors (weather, day, night, etc) surrounding you. You can read more about the differences between meditation, pathwalking, and hedge riding in my other post Meditation, Pathwalking, and Hedge Riding: Making Sense of It All. To hedge ride, the witch must enter an altered state of consciousness (ASC). This can be done using a variety of techniques, including drumming, dancing, chanting, flying ointments, or mind-altering drugs. Today, many hedgewitches, including myself, do not condone or support the use of drugs to reach an altered state of consciousness (ASC). It is too dangerous, not only in the short-term while traveling, but also long-term as many mind-altering substances impact the body negatively. Flying ointments are thusly named because they allowed the witch to enter an ASC and thus fly or hedge ride to other worlds. While many ointments used in the past are no longer safe, there are some that can be safely used today to help induce an ASC. While hedge riding is making a comeback, the practice itself is actually quiet old. Originally, hedgewitches were the cunning people or wise folk who lived on the outskirts of town, by the hedge. There is no central dogma for hedgewitches, but much of what hedgewitches practice are based on historical texts with modern interpretations and adaptions. However, there is one text in particular that gives particular insight into hedge riding, The Havamal. Of their own skins, and of their own souls. Hence to their own homes. Both translations are a charm that can either cause the hedge rider to show their true self and return home, or cause the rider's spirit to separate from their physical body. Either way, these charms tell us that hedge riders traveled or flew to otherworldly realms, usually in another form. While meditation and pathwalking are safe practices, hedge riding is not. Because your spirit or soul physically leaves our realm to enter that of another, there are risks involved. Not every spirit or entity you meet is there to help you. In fact, there are many that wish you harm. Taking the proper precautions will ensure your safety. I'll cover how to safely travel later in the series. Because of this, hedge riding is not for the novice or anyone unable to focus their mind for long periods of time. However, you shouldn't fear hedge riding. It is wonderful to experience and will aid any witch in furthering their magical path. Hopefully I haven't scared you off, but instead peeked your interest! So what other topics can you look forward to in this series? I'm glad! I am working on getting out the third part right now. Been really busy with my personal life and work for the past month and with testing season upon us it is only getting busier. This is probably the worst time of year for me. Haha! 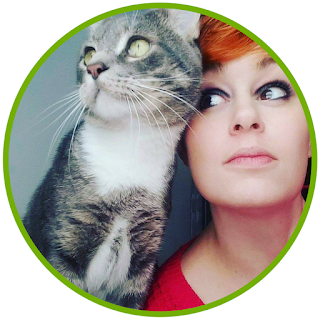 Keep an eye out for the third post, and thank you for reading! These blogs are amazing. They have got to be some of the best information on hedge riding on the internet right now. In one of your posts could you include how to move from one realm to the next? Or how to create your door to the other? Sorry if you already planned on it. I'm itching to read more. Sure! I'll make sure to include how to travel between realms in a later post. Thank you for reading.